This was published a few years ago in PHONEBOOK, (published jointly by threewalls & the green lantern press) an index/archive of “alternative” art practice across the country. I’m revisiting all this stuff at the moment as I work to put together some thoughts on the next incarnation of The Green Lantern. Last fall I met a Canadian fellow in the middle of the Santa Cruz Mountains. I was in the middle of a meditation retreat and he happened to be there for the same. A few of us in the group woke up early one day, before the sunrise, to hike up one of the peaks. We wanted to get to the top in time to see the sun kiss the flanks of the surrounding mountains. We woke up in the middle of the dark and made our way through the woods, tripping now and again on stray roots in the ground. Aside from our footsteps everything was terribly still, the dark a thick cloak of ink around everything. While I could feel my companions close, I could not make out their faces. One woman was wearing a white sweatshirt and aside from the tiny flashlight orbs, trained on the ground, she was the thing to follow. Her shirt a ghost. At a certain point on the hike, I realized that Henry regularly referred to a woman in his life. Jill, her name was. She lived in New York. He lived Vancouver. He didn’t call her his girlfriend. He only called her by name. And yet she frequented enough of his stories, as a sideline, not the subject, that the intimacy of their relationship became clear. Finally at breakfast another one of the hikers, Mike, asked about her. “That’s funny that,” he said. The way he spoke, his words were flecked with a European inflection, what I at first assumed was part of the Canadian way. “We spent forever trying to work out what to call ourselves. We tried everything. We weren’t happy with any of them. Girlfriend/boyfriend. Lover. Friend. My parents are Dutch immigrants, so we even tried some other words, amore, leipschen. Cabbage. Each thing seemed too limited, too entrenched in a system of expectations and roles and obligations. Obligations that were imposed by society, as part of the definition of those terms. You can imagine, of course, at this point in the conversation the whole table was waiting, the knives and forks suspended for a moment; steam from tea rising, a few peculiar smiles on the faces of his audience. Many of them wore wedding bands. To my mind, it is additionally perfect because the name belies certain awkwardness, acknowledging the need to appropriate another language, reaching outside of one tradition to another, in order to transplant another set of terms that might function as a blank slate. It wouldn’t do to make up a name from gibberish, for in doing so one runs the risk of denying a certain degree of importance in the relationship being named. Instead one looks for name that carries with it enough meaning, a meaning that is nevertheless ambiguous, so that the power of defining meaning clearly is in the hands of the founding members. After the release of last year’s PHONEBOOK, I heard concerns, nothing directly, but maybe in the way that these communities operate, through a chain of conversations that traveled like a brush fire through the community. One group started talking about the problem with the title “Alternative Art space,” and whether or not they felt comfortable being represented under that moniker. Members of that conversation ended up at a bar, perhaps, a few weeks later and the subject came up again, and so on. The obvious failings of the term came to light within the same community our index is trying to represent. I believe that in this way, in discovering the limitations of this or that, we might discover, collectively, through dialogue, more common ground. Through these conversations we might reach toward a clarity of vision, something that will both further define the unique and peculiar manifestations of each space, while also demonstrating something common: an impulse, one or several goals, a questioning of culture as it is. While developing that dialogue, mapping out intentions and choices, we may actually empower ourselves as well. In my mind, the most important thing to recognize is that there will never be one name that incorporates each space. If anything each space is like it’s own family, operating like a tribe within each city. At the same time, there is at least one thing that we all share: that is, we are creating different kinds of cultural venues, providing new and idiosyncratic personalities in the midst of an increasingly homogenous cultural landscape. Nevertheless, I think it’s important that we don’t let our differences prevent collaboration. If we are to celebrate community, personality and culture outside of the mainstream, if we really want to influence the world in which we live, we must embrace and celebrate one another as much as we do ourselves. In some sense this is an apologia. Apologizing up front for the invariable ways in which PHONEBOOK will fall short of a complete and perfect categorical index. We don’t even scratch the surface. I’m sure about that. Furthermore we are celebrating a myriad of practices, and imagining that one term would sufficiently sum everything up would do us a disservice. It is precisely because the venues listed here provide different colors, emphasese and aesthetics that they accomplish so mean so much to the communities involved. I’m additionally sure that, despite our best efforts, PHONEBOOK 2008/2009 will make other blunders, an issue not addressed that perhaps misrepresents one or another of the organizations listed. In anticipation of those instances, I would invite everyone to send us an email, write a letter or even just talk to your peers. We want to hear them. Those moments are opportunities for better understanding. Like Henry and Jill, a number of these organizations, if not all, are working to redefine their relationship in society. There is a great power in naming things. I would argue that, through the naming things, we define our world, isolating traits that seem most prominent and then, through the exercise of that name, those traits seem to best embody the thing itself. Whether one calls the world ugly, or beautiful, for instance, affects the way one sees that same world. More importantly though, names reflect the way we think about things, and way one thinks about his or her community, its extent, its bounds, will influence the impact it might have. We have kept the name Alternative Art space on the list. Some spaces use it. It is also a name recognized by the greater public, one with perhaps less access to these watering holes. It is important to give that public a chance to see these spaces, for it is likely that more opportunities to experience divergent cultural media will have a long standing impact on the world we live in. Phonebook is now available on SPD! posted by Caroline Picard, you can check it out here! C. Picard, N. Sarno & S. Stratton, Eds. Cultural Writing. Art. Reference. Edited by Caroline Picard, Nick Sarno, and Shannon Stratton. Back by popular demand, PHONEBOOK is the essential travel guide to artist-run centers, small not-for-profit, fringe galleries, and other exhibition and presentation projects. This new edition adds over 50 news spaces in the United States and over 40 Canadian centers alongside updated entries, periodical listings, a series of essays from across the country and some road-trip tips from the editors. PHONEBOOK is a valuable resource for artist and audience alike, connecting a web of makers and projects while acting as an archive of work by smaller organizations and groups throughout the visual arts community. Use PHONEBOOK 2008/2009 as a research tool, as a travel guide to the visual arts, for networking, for exhibition proposals or to facilitate artistic exchanges. CHICAGO:Back by popular demand,PHONEBOOK,the essential travel guide to artist-run centers,small not-for-profit,fringe galleries and other exhibition and presentation projects,will be released October 23rd at threewalls. 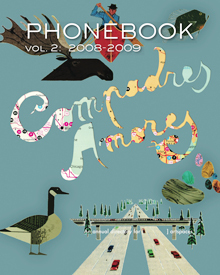 country and some road-trip tips from the editors.PHONEBOOK is a valuable resource for artist and audience alike,connecting a web of makers and projects while acting as an archive of work by smaller organizations and groups throughout the visual arts community. Use PhoneBook as a research tool,as a travel guide to the visual arts,for networking, for exhibition proposals or to facilitate artistic exchanges. Please join us for PHONEBOOK’s release party,held in conjunction with a special threewallsSALON,”Enablers and Platformists:turning the content over to participation,”an open discussion about artists working as presenters and enablers of other creative and intellectual projects. or go directly to www.spdbooks.org. Helen Money is Alison Chesley, a Chicago based cellist who has become known for her unique sound and compelling stage performance. Using the tools of a lead guitarist, she channels her sensibilities and experience as a rock musician through a classical instrument. A founding member of Epic Records recording artist Verbow, Alison has opened for bands as diverse as Shellac, Earth, The Bad Plus, Hunn Huur Tu and KTL. She has also worked and recorded with musicians such as Bob Mould, Disturbed, Frank Orrall, Fred Lonberg-Holm and Mono, among others. In addition to her solo work, Chesley has composed music for film and dance, including the soundtrack to the award-winning documentary “Indestructible” and two major works for Chicago based Mordine and Company Dance Theater, “Quest” and “Time Stilled”. She also recently completed the full-length album Aural Anarchy with poet Krista Franklin, exploring the life, work, mythology and influence of Jimi Hendrix. exhibition proposals or to facilitate artistic exchanges. presenters and enablers of other creative and intellectual projects. and pre-orders please contact Nick Sarno, Editor of The Green Lantern Press at sarno@thegreenlantern.org. audience by contextualizing its events through writing, video and performance. threewalls is a nonprofit 501(c)3 organization dedicated to contemporary art practice and discourse. and writers who are at pivotal points in their careers. posted by Caroline Picard and written by Nell Taylor. Collecting ephemera is an act of city beautification. Cities look their best in detail. I could describe Chicago as a large Midwestern area on Lake Michigan populated by sports fans and colorful politicians and composed of a series of communities linked together by common streets and not much else. There are some tall buildings that have become relatively less tall in the last couple of years. You would know this is Chicago. Creative people seem obsessed with the lack of attention their work receives in this overcrowded stadium-in-a-cornfield; having bought into the myths promulgated by this “big picture” vision of the city, they despair at their own artistic marginalization. They look out over the horizon (–is that Naperville, getting even bigger? And is it coming this way?) for an audience or even just a sounding board, another artist with whom to compare notes and ideas. 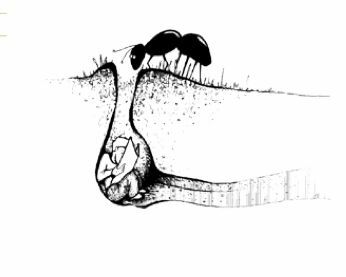 On the off-chance that they find one another, they immediately set about building a bunker, stocking it full of their pooled resources, and disseminating exhibitions and publications of each other’s work to the outside world. They defend their fort, tooth and nail, from interlopers. They spread out. They divide and conquer. They hide themselves so well in these small spaces that the new arrivals seeking out community can’t see the bunkers for the shiny new residential developments and overstuffed shopping carts rising higher and higher into the air. The new crop finds the old myths justified and begin the cycle again. Now say you took the output from all of these art-shelters and lined them up on a shelf; the project documentation, the journals, the handmade books, the zines, catalogs, manifestos, newsletters, magazines, chapbooks, programs. For the sake of argument, include works by those sports fans and news on those colorful politicians, particularly if it was written anonymously in all block-caps and shoved into your hand by a guy with a bullhorn as you walked to work. And force yourself to look at them as if it was your first moment to discover each object; it might not be to your taste, it might seem shoddily assembled; you find it pretentious or simplistic, you don’t agree with the point of view, it’s covered in mold from someone’s basement, the author declares that their dog peed on the very object you hold in your hand (edition 3/50). But there are individuals behind each one and at some point, they have witnessed things you haven’t. And you’ve never lived in their heads (of course not, you’ve been holed up in your bunker). Despite your initial (and often better) judgment, you learn something. And another city starts to emerge. In the course of running the CUL, I have found myself fascinated by the passions ignited in a ten-year old Museum of Science and Industry controversy; moved by a 16 year old stoner’s alternate party documentation and musings on 9/11; reading an entire zine on home-schooling cover to cover that doubles as a critique of the CPS; lost in a series of 25 year old newspapers that are nothing but gorgeous advertisements; and discovering political actions that literally took place outside my door. These ephemeral objects cause me to reconsider my own ideas of the city’s history as all of these details begin to fill in the rich tapestry subsumed by the “Hog Butcher for the World” view of Chicago. Beyond that impersonal historicism, though, I appreciate that these works make me question where I was at that particular time. What I was doing and what I was contributing to that tapestry at that moment. Documenting the creativity of the city is an excellent weapon to use against apathy. To those who complain that the city isn’t what it used to be and that there is nothing to do here anymore, I like the idea of sitting them down in front of a pile of works from our collection and saying: Here are your tools, figure out what you’re going to do about it. It’s not only about documenting the past; it is meant to inspire and to incite people to create new work and to be more active– in the present and for the future. Ephemera presents a holistic view of Chicago’s creative communities by using tiny little details found in the cracks and crevices of our bunkers to help break them down and encourage the kind of collaboration necessary to, as your local street corner waste basket would say, keep Chicago beautiful.